Rahm Emanuel will face Jesus 'Chuy' Garcia in a runoff election on Tuesday, April 7 - a first in city history. CHICAGO (WLS) -- Chicago voters have another six weeks to decide who will be the city's next mayor: Mayor Rahm Emanuel or Cook County Commissioner Jesus "Chuy" Garcia. Emanuel will face Garcia in a runoff election on Tuesday, April 7 - a first in city history. The incumbent mayor got 45 percent of the vote on Tuesday. He needed more than 50 percent of the vote to avoid a runoff. Garcia came in second, with 33 percent of the vote. "You had a multi-candidate race - a vigorous campaign. Each candidate had a constituency or constituencies. It's hard to pull together an absolute majority in a situation like that," said David Axelrod, President Barack Obama's former chief advisor. Businessman Willie Wilson received 10 percent, Alderman Bob Fioretti got 7 percent and perennial candidate William "Dock" Walls finished with 2 percent of the vote. Mayor Rahm Emanuel thanks voters Wednesday morning at the CTA Red Line stop at 95th Street and the Dan Ryan Expressway. 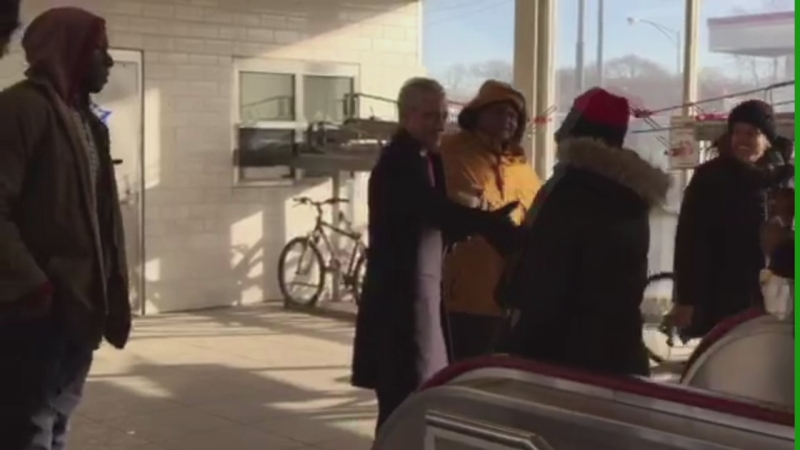 Mayor Rahm Emanuel thanked voters at the CTA Red Line 95th/Dan Ryan station Wednesday morning. The mayor has six weeks to convince voters that he deserves to keep his office at City Hall. He expects to pick up votes in the run-off election from people who did not vote for Garcia on Tuesday. 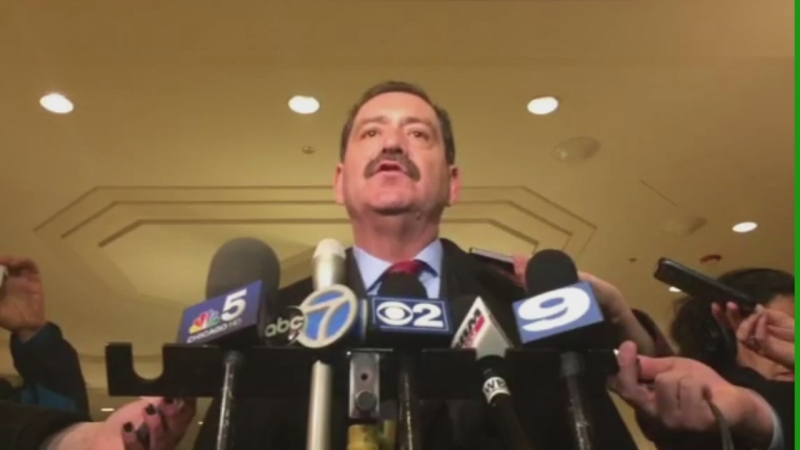 "I think that a lot of support will flow to Rahm and some will flow to Chuy as a result. At the end of the day, I think Rahm wins that choice," Axelrod said. Part of the reason for the runoff, is a very low voter turnout. In 2011, Emanuel got more 326,000 votes. This year, that number dropped off by nearly a third, to about 210,000 votes. That's almost equal to the number of people who stayed home this year, compared to four years ago. Emanuel spent over $10 million dollars and had major endorsers, including President Obama. But he isn't wasting any time back on the campaign trail. On Wednesday morning, Emanuel was back where his career in mayoral politics began in 2010 - greeting commuters at the 95th Street CTA stop. "I'm gonna be out every morning, every evening trying to earn people's support and vote," Emanuel said. Emanuel campaigned at a senior center on Wednesday afternoon. He said that he failed to reach the needed majority because so many candidates were on the ballot. "It's no longer a multiple choice. It's a clear choice between two different visions of the future and how to get there," Emanuel said. City Clerk Susana Mendoza, Mayor Rahm Emanuel's re-election co-chair, speaks on his next steps leading up to the runoff election on April 7. 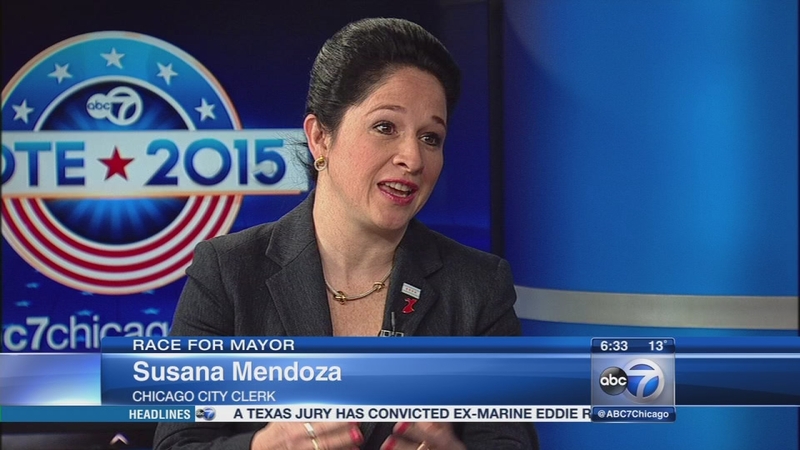 City Clerk Susana Mendoza, Emanuel's re-election campaign co-chair, said moving forward, they may have to do a better job of getting facts about the mayor out to the people. She said Emanuel has been tested in terms of his leadership decisions and has had to make tough choices. "Being a leader is not winning a popularity contest. It's not enough to say, 'I'm a neighborhood guy' or 'I'm the other guy in this race.' Tell me what you're going to do, or more importantly what you have done over the last 30 years in office, to benefit the neighborhoods other than yourself," Mendoza said. Mendoza said a candidate must outline a clear plan for the future and show what he is capable of accomplishing as an elected official. Cook County Commissioner Jesus "Chuy" Garcia spoke to the media after thanking voters Wednesday morning. Commissioner Garcia thanked voters at the CTA Brown Line Merchandise Mart station Wednesday morning. He also promised a spirited push to raise more money for the runoff. "I'm a Chicagoan! I was raised in Chicago. I breathe Chicago. I sleep Chicago. Chicagoans are scrappy and I think I'm scrappier because I'm the neighborhood boy," Garcia said. Garcia said he expects to win the support of at least two of his former challengers: Fioretti and Wilson. He celebrated his second-place finish Tuesday night, alluding to support from bus drivers, train operators, police officers, emergency responders, health care workers, teachers and working parents. He won 11 out of Chicago's 12 largely Hispanic wards on the Northwest and Southwest sides. The commissioner played to voters who are not part of the so-called "one percent" represented by the current mayor. Garcia pointed out repeatedly, before the election, that the millions that bankrolled Emanuel's television campaign blitz were provided by a wealthy few whose interests don't align with most Chicagoans. "No, I'm not surprised the current mayor is very unpopular, despite money, because of what he did with the schools and crime. He's not what he appears to be. A lot of people know that. That's why you see the result. Our job is to convince them Chuy Garcia is the guy who will take the city in a better direction and that's our challenge the next few weeks," Cook County Clerk David Orr said. The commissioner said he wants to reduce crime rates across the city by hiring more officers, though he hasn't said how he would pay for those salaries. He has also said he plans to strengthen the Chicago Public School system, which would otherwise close dozens of buildings under the existing administration's budget balancing initiatives. During his speech to supporters on Tuesday night, Emanuel spoke highly of Garcia. But Emanuel's political action aired negative television ads during the past week questioning the challenger's character. "I didn't like those ads, I think they went over the top and I think the voters saw through them," Garcia said. When asked if he would go negative in any way, Garcia responded: "If distortions of my history or my character come my way, I will defend myself." For the record, the mayor made a promise Wednesday that he and his PAC would remain positive. "I plan on running a campaign of ideas and not insults," Emanuel said. Both sides expect a much higher turnout at the April 7 election than the 33% of registered voters who cast ballots on Tuesday. The weather should be better, and the public interest in the Chicago mayor's race is already soaring.